Do Saturated Fats Cause Heart Disease? “Direct evidence on the effect of the diet on human arteriosclerosis is very little and likely to remain so for some time” . 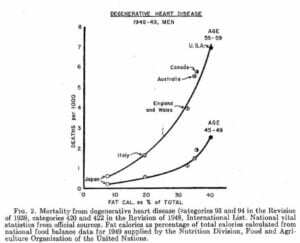 In 1953, Ancel Keys published the results of his “Six Countries Study“ , where he said that he had demonstrated that there was an association between dietary fat as a percentage of daily calories and death from degenerative heart disease. 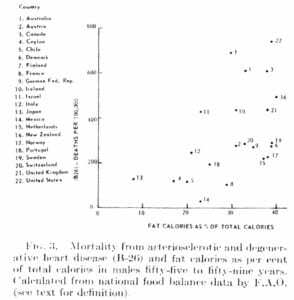 Four years later, in 1957, Yerushalamy published a paper with data from 22 countries , which showed a much weaker relationship between dietary fat and death by coronary heart disease than was suggested by Keys’s Six Countries Study data. Nevertheless, in 1970, Keys went on to publish his Seven Countries Study in which maintained there was an associative relationship between increased dietary saturated fat and Coronary Heart Disease -basically ignoring the data presented in Yerushalamy’s 1957 study and failing to study countries where Yerushalamy found no relationship, such as France. In a paper published in 1989 based on food consumption patterns in the 1960s in the seven countries , Keys said that the average consumption of animal foods (with the exception of fish) was positively associated with 25 year CHD mortality (death) rates and the average intake of saturated fat was strongly related to 10 and 25 year CHD mortality rates. Keys knew of Yerushalamy’s data from 1957 and ignored it. Keys methodology has been widely criticized for selecting data only from the 7 countries that best fit his hypothesis. In August of 1967, just as Ancel Keys had published his Seven Country Study, Stare, Hegsted and McGandy – the 3 Harvard researchers paid by the sugar industry published their review in the New England Journal of Medicine, titled “Dietary fats, carbohydrates and atherosclerotic vascular disease” which vindicated sugar as a contributor of heart disease and laid the blame on dietary fat and in particular, saturated fat and dietary cholesterol (see previous article on that topic). What are the findings of current scientific literature? Eight recent meta-analysis and systemic reviews which reviewed evidence from randomized control trials (RCT) that had been conducted between 2009-2017 did not find an association between saturated fat intake and the risk of heart disease [16-21]. Furthermore, recently published results of the largest and most global epidemiological study published in December 2017 in The Lancet  found that those who ate the largest amount of saturated fats had significantly reduced rates of mortality and that low consumption (6-7% of calories) of saturated fat was associated with increased risk of stroke. “There were no clear effects of dietary fat changes on total mortality or cardiovascular mortality”. Note: The one significant finding was an effect for saturated fats on cardiovascular events however this finding lost significance when subjected to a sensitivity analysis (Table 8, page 137). Only one recent meta analysis conducted by the American Heart Association (by the authors of the Diet-Heart Policy for Americans, mentioned above) found a relationship between saturated fat intake and coronary heart disease, yet failed to examine cardiovascular mortality (death) or total mortality . NOTE: In 1961, the American Heart Association was the author of the original policy paper recommending to limit saturated fats to protect against heart disease and therefore has a significant interest in defending its longtime institutional position. With the exception of the American Heart Association review, the conclusion of 9 different meta-analysis and review papers of randomized control trials conducted by independent teams of scientists worldwide do not support the belief that dietary intake of saturated fat causes heart disease. Those critical of the study say that it has methodological problems, including problems related to the authors dividing consumption of macronutrients (protein, fat and carbohydrate) into 4 groups (quintiles). Some say that this is reason the data showed an inverse relationship between saturated fat and cardiovascular disease . Criticisms also include that one cannot compare data between countries of substantially different level of income because “low fat consumption is very uncommon in high income countries” and that ‘the ability to afford certain foods may change the dietary pattern (e.g. high-carbohydrate and low-fat diets may be associated with poverty) . Both the American and Canadian governments are currently in the process of revising their Dietary Guidelines and I feel that what is needed now is an external, independent scientific review of the current evidence-base for the belief that saturated fat contributes to heart disease. Have questions about which types of fats are best to include in your diet and which are best to limit? Please send me a note using the “Contact Me” tab above and I will reply shortly.